It’s definitely a very busy day for U Mobile. On top of making its postpaid voice/data plans a lot more affordable and attractive, U Mobile also revised its postpaid broadband plans, offering extra 2GB of all-day data – it even comes with a free 21Mbps MiFi modem. Just like its postpaid plan promotion, the new postpaid broadband promotion is valid until 31 August 2015, and once you’ve signed up, the extra data will remain as long as you are subscribed to the plan. The 2GB of extra data each month is valid for MB40, MB68, MB88 and MB128 plans, which comes with 4GB + 2GB, 7GB + 5GB, 9GB + 14GB and 12GB + 20GB of data respectively. The 4GB, 7GB, 9GB and 14GB data are available for use for the entire day, while the extra data (2GB, 5GB, 14GB and 20GB) are available for off-peak period only (2am to 9am). This promotion is in conjunction with U Mobile’s existing free data for video and music streaming promotion. 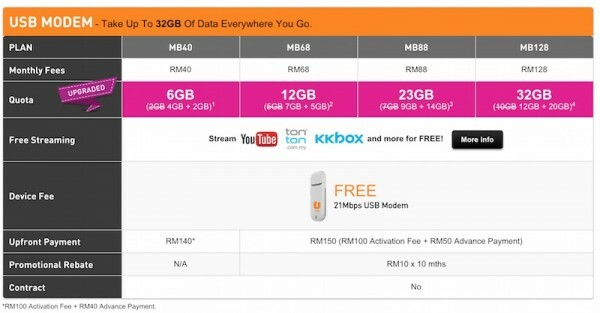 This means that on top of getting more all-day data, you can watch your favourite videos on YouTube and TonTon, or listen to your favourite music (Era FM, Hitz FM, My FM and KKBox), without consuming up your data. More information available in this link. Visit U Mobile for more information about its postpaid broadband plan promotion.